Damper Adjustments no longer required. 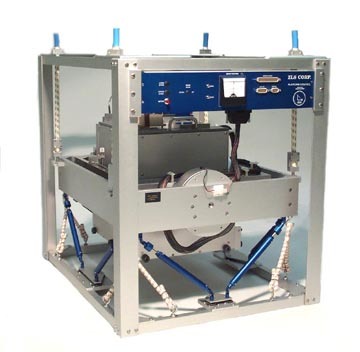 Eliminates the cross-coupling errors inherent in older beam-type gravity meters. Residual imperfection errors are typically three to five times smaller than beam meters. Liquid damping virtually eliminates the sensitivity to vibration common in air-damped sensors. Eliminates the “slope error” prevalent in beam meters. The system utilizes the field proven ZLS FogPack. The system utilizes the ZLS UltraSys control system that is the standard of the industry. ZLS has upgraded approximately 75% of currently operating Model S gravity meters with its control systems. The new sensor eliminates the cross-coupling errors inherent in older beam-type gravity meters by constraining the proof mass to vertical linear motion. Damper adjustments are no longer required. The new sensor utilizes liquid damping that virtually eliminates the sensitivity to vibration common in air-damped sensors. Residual imperfection errors, due to minute variations in manufacture of the system are typically three to five times smaller than those for beam type sensors. Unlike beam type meters, imperfection errors are stable with time and do not require regular testing to track changes. The new design eliminates the “slope error” prevalent in beam meters that causes reading errors with beam position under dynamic conditions. Transducer outputs are digitized with little additional analog processing. The ZLS system digitizes input signals 200 times a second. All processing, including filtering, is done digitally. All control-loop algorithms, for both the platform and gravity sensor, are performed digitally by an embedded computer. Eliminating analog circuits enhances reliability and simplifies servicing. 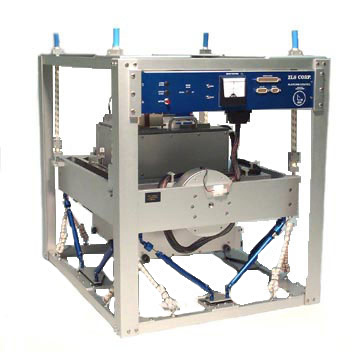 UltraSys™ utilizes an embedded processor to perform all of the platform and sensor control functions. The power module may be located anywhere within 3 meters of the platform. A host computer, connected to the control module with a serial cable, completes the system. The embedded processor is connected to a host computer through a serial port. Using ZLS-supplied software, the host computer processes the data as required for high resolution or standard marine operations and archives the final data. Raw data from the accelerometers, gyros, and gravity transducer are digitized 200 times a second with a 16-bit A/D converter and processed by the embedded computer. Analog signal outputs to control the motor and gyros are provided by a 16-bit D/A converter, which is also updated at 200 Hz. Slightly filtered data are transmitted to the host computer once per second. The host computer stores all data on hard disk and can simultaneously direct data to the video monitor, serial port, and printer in a variety of formats. Either a numerical or graphical format may be selected for display on the printer. In high-resolution marine and airplane modes, raw data are recorded once per second, allowing the user to custom filter the data for specific applications. In marine mode the data are filtered in appropriate manner for marine data and recorded at 10-second intervals. Additional external data may be appended to the gravity data. The system accommodates up to four analog channels and a 24-bit digital channel. The system is fully automatic and will start unattended after a power interruption. Operation is as simple as turning on the switch. However, all system functions can be controlled manually through menu selections. All keystrokes are logged in a separate file for a complete record of system activity. System functions are continuously monitored and UltraSys™ will automatically shut down and activate an external alarm signal in the event of a serious malfunction. Digital techniques replace analog hardware, eliminating electronic drift and enhancing system reliability. Fully automatic system will start and function unattended after a power interruption. Full manual control through menu selection. 200 Hz data sample rate accurately digitizes sensor, gyro and accelerometer signals assuring no loss of signal information. 200 Hz update of platform feedback loops provides superior platform control. Simultaneous data output to video monitor, hard disk, serial port, and printer. Graphic or digital format may be selected for printer output. Alarm function shuts down system and provides a remote alarm signal in the event of a serious system malfunction. Keyboard log records all keyboard activity for review. Complete testing and final adjustment using the ZLS test facility. 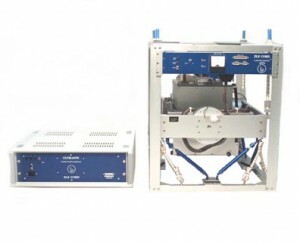 Self-contained precision gyro power supply and servo amplifiers. The accuracy of a marine gravity meter is difficult to specify as it is dependent on the characteristics of the ship, the sea-state, and accuracy of navigation. ZLS’s full digital control system enhances overall system accuracy by eliminating the gain and offset drifts that are inherent with analog electronics. It permits the platform and sensor control parameters to be set more precisely. In analog systems, these parameters are adjusted by changing electronic components, whereas, in digital systems, they are adjusted by simply entering a number in the computer. 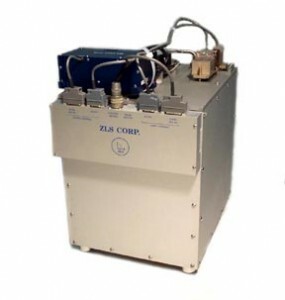 Accuracy of the ZLS Dynamic meter is difficult to specify, as it is dependent on the characteristics of the ship, the sea-state, and accuracy of navigation (typically 1 mGal). * measured at 117 Volts 60 Hz. Adjustability: sufficient for 5 years of aging. * A second serial port is required to transmit data serially. A USB to serial adapter is acceptable. Specifications are subject to change without notice. Results may vary depending on conditions. The following are trademarks or registered trademarks of their respective companies or organizations: ZLS Dynamic Gravity Meter™ and UltraSys™, ZLS Logo / ZLS Corporation.DOS, Windows / Microsoft Corporation.